A Cirque De Soleil artist slipped and fell during a performance in Las Vegas on Friday night, according to the organization. The incident came just a few days after Cirque du Soleil was told it would be fined in the death of another performer. The Cirque De Soleil acrobat was performing in an act known as the “Wheel of Death” during the 7 p.m. showing of the Zarkana stage production at the Aria Resort and Casino when he slipped and fell off the wheel, according to a statement on the group’s official Facebook page. The performance was stopped and the artist was taken by ambulance to the University Medical Center in Las Vegas, according to Cirque de Soleil spokesman Ann Paladie. He was in stable condition Saturday and was expected to be released in the next few days. Ann Paladie said the acrobat was previously a performer in the group’s production KOOZA prior to performing in Zarkana. The Clark County Fire Department confirmed it responded to a call that someone had fallen about 20 feet. 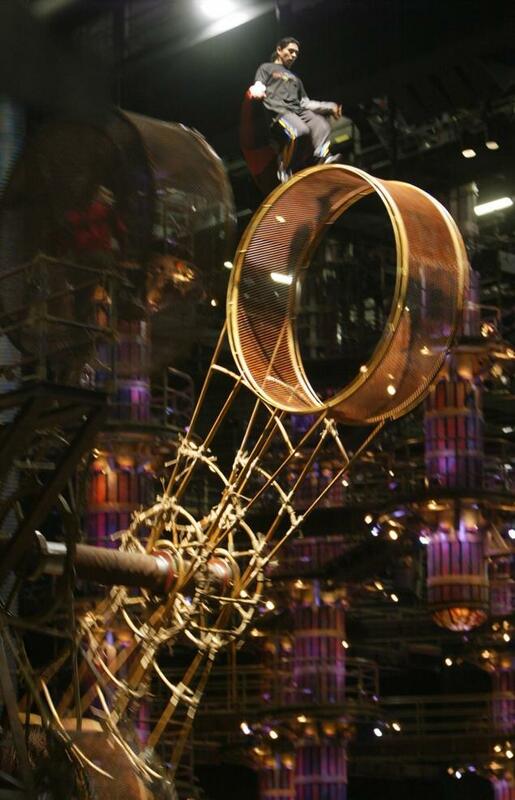 Zarkana includes Cirque du Soleil’s signature acrobatics far above the stage.